REAR TUBE BUMPER WITH HITCH, BLACK TEXTURED, 55-86 JEEP CJ5, CJ7 (TWO BOXES) - Jeep Parts Guy - All the Jeep Parts You Need! 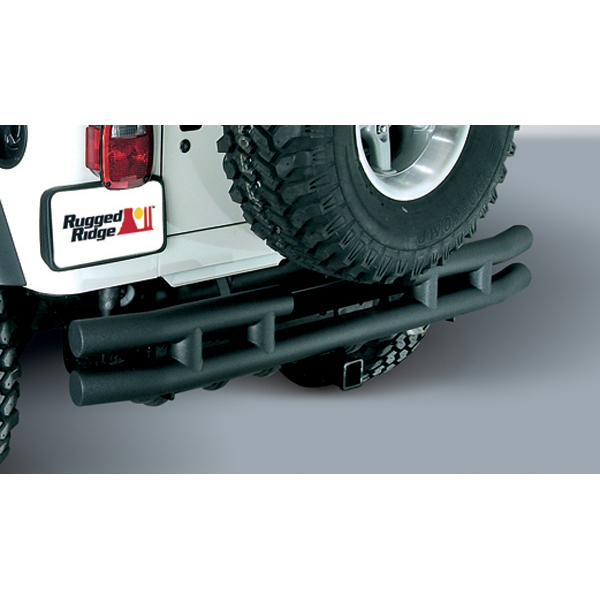 All Rugged Ridge bumpers feature smooth ground welds for an unbelievable look and further rust protection. No other tubular bumper manufacturer goes to the expense of smooth grinding their welds. This exclusive smooth grind process goes to the expense of smooth grinding their welds. This exclusive smooth grind process virtually eliminates small weld "pockets" that never seem to get full paint coverage and tend to rust over time. Finally, all Rugged Ridge Bumpers feature welded end caps rather than plastic end caps. Gone are the days of constantly replacing those lost tube bumper end caps after a long day on the trail. Rear Bumpers have a larger 17" rear opening allowing the use of oversized tires (up to 31") on the factory spare tire mount. This is a Rugged Ridge Exclusive! It also features an optional frame mounted hitch option that allows for lightweight towing (2,000lb towing weight, 200lb tongue weight capacity). Most other rear tube bumpers with integrated hitch boxes do not recommend towing therefore making the hitch box virtually useless.